When I first found RoadsideWonders.net it was like discovering a long lost road sister; another woman motorcyclist who is crazy about muffler men, giant chickens and roadside treasures that the kooks of the world put on display. Since then, I’ve been hooked on Roadside Wonders. There is always something fabulously kitschy popping up in her funky database of roadside goodness. 1. Tell us about your motorcycle. I currently ride a 2004 Honda Aero 750. I’m just a little over 5’ tall. To make matters worse, I have a 24” inseam. Short legs on a short person – oh, what a combination! I was interested in several other models while shopping; but I hesitated investing time and money in lowering a bike with the possibility of not liking how it handled after the modification. The Aero’s low seat and stretched frame made it easy for me to jump on and enjoy the ride from the get-go. Plus, I like the retro-styling — and the fact that it has a big bike feel in a small package. My Aero’s name is “Bruiser”. On one of my first trips after buying the Aero, I was parked in front of a convenience store and a gentleman approached me with a big grin. “That thing sure is a big bruiser for a little gal” he said. Normally I would have protested at being referred to as a little gal, but his heart was in the right place. I thought his expression was so cute that it stuck with me … and it fit. 2. Have you been riding for many years? I had a friend in high school who owned a few dirt bikes. I learned the basics, but I didn’t ride again until about 2000. 3. Was there someone or something specific that encouraged you to start riding? My partner, John, his family, and many of our friends ride. I’m a control freak and hate riding behind anyone; so it didn’t take long for me to invest in my own. 4. How did Roadside Wonders come about? 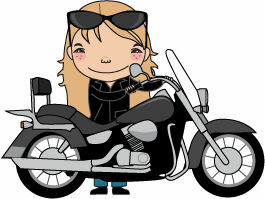 I belong to an “online sisterhood” of motorcyclists; Rumble Sisters. We have a very active forum and we also get together as a group once a year (we have local and regional meet-ups as well). We were discussing the “Madonnas of the Trail” one evening and it mushroomed into individuals making plans to snag pictures in front of each of the Madonnas. I took the Pennsylvania & Maryland Madonnas and offered to post pictures on a personal blog that I kept at the time. I have always loved Muffler Men and “World’s Biggest” attractions. I started to add those to the site. Before long, friends and friends of friends began emailing their interesting roadside photos to me as well. In early 2009, I decided that I should do away with my personal blog and concentrate on sharing roadside “wonders” with a wider audience. RoadsideWonders was born. 5. What do you think makes traveling by motorcycle to visit roadside attractions such a great fit? I love playing with maps and planning routes. Locating, bookmarking, and researching new places to visit satisfies that fixation. I view road trips in cars as a social activity. I often travel alone; so at those times I’d rather combine my passions and ride rather than being cooped-up in a car by myself. Posing my bike at my destination provides a bit of a personal signature to the images. Riding alone never seems lonely. In fact, it’s good therapy. Which isn’t to say that I never ride with others; I enjoy that as well. 6. Your website Roadside Wonders encourages other people to submit their roadside finds and photos. What are the rules? How do we send you the goods? Contributors are free (but not required) to submit a story or narrative about how they found it, the trip they took to get there, other nearby attractions etc. If you’d like to play along at home, visit Roadside Wonders submission page and send in your fabulous finds! 7. Are most of the folks who submit roadside wonders for posting on your site also riders? Initially that was the case, but I estimate the ratio is currently about 60% riders/30% non-riders. That’s great! I don’t want to exclude anyone based upon how they happened to arrive at their “wonders”. 8. In your opinion, what makes something Roadside Wonder-worthy? Wow, that’s a hard one! Anything from the Washington Monument to a teddy bear made from stacks of hay (Yes, RoadsideWonders has one of those!). I don’t discriminate between vintage and brand spanking new though I’m more often personally drawn to vintage places/things. Statues, diners, “world’s ____est” anything, cool signs, old barns, unusual bridges, offbeat museums, historic sites, weird memorials, unique motorcycles and cars tend to be the best finds. I also have a thing for locations where movies were filmed. That might be stretching the roadside wonder theme . . . but hey, it’s my blog and I’ll blog them if I want to, right? What’s not a wonder? Well, we all have Danny’s, McDaniel’s, and Saltine Barrels (names changed to protect the mundane) seemingly around every corner, so they probably won’t be roadside wonders until they’re nearly extinct. 9. Do you do as much road-tripping in the car as you do on two wheels? I do more on the bike than in the car – unless time constraints or weather dictate. 10. What is the farthest ride mileage-wise that you’ve taken just to see some roadside wonder? Florida. But my camera and memory card flew out of my roll bag when I was more than halfway home. I’m still not over that yet. 11. Do you use a GPS when traveling or do you go old school with paper maps and a route sheet? No GPS. I try to leave technology behind. I don’t even bring my laptop. I really would like to leave my cell phone behind too; but my family would have a conniption fit. Generally, I print my trip out in segments and tape those to the inside corner of my windshield. It’s also not unusual for me to just pick a direction and not really plan my destination unless I’m pressed for time. 12. What are you hoping to visit in 2010? 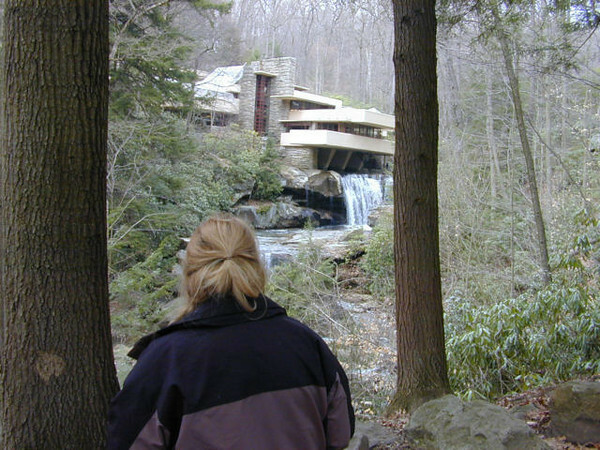 Do you have any big plans to mark something off of your “Must See” list? I have several trips mapped-out that I’d like to take before winter – a New England route, a Route 30 trip, a Western NY trip. Nothing huge this year. Next year, I’d like to take a few weeks to go West. I’ve only done the American West by auto and it was a long time ago. I’d like to tackle it via motorcycle if I can arrange to have that many vacation days in a row. 13. How do you find things that you want to visit? Do you have any regular haunts for finding information? Word-of-mouth, travel websites, books, forum, Twitter & Facebook friends, magazine articles . . . you name it. I’m always adding something to my never-ending list of places to see both domestic and foreign. 14. Has social media like Twitter and Facebook made it any easier for you to pick up tips? Absolutely. It’s great to absorb other enthusiasts’ writing styles and photography. It’s also a pleasure to interact with people who “get” why finding the perfect diner is such a treat, why driving several hundred miles to see a re-purposed Muffler Man is a completely sane pursuit, and who know the difference between a Texas Weiner and a hotdog made in Texas. Follow RoadsideWonder on Twitter and Facebook! 15. Have you ever been let down by an attraction? For example – have you ever ridden a long way only to find something closed, gone or simply not what you had imagined? That question is easy to answer. Do a Google image search for the University of Delaware Blue Hen statue. There is a good reason why my photo of it is the only correct match in the results. The hen is not very impressive and it’s hard to find to boot. It’s buried in a little culvert between a hotel/conference center and a steep hill behind a residence hall. Luckily, that area of Delaware was a treasure trove of other things to snag for the site. All was not lost …and truthfully, no day spent riding is ever a loss. 16. On the flipside has anything really knocked your socks off? I think the Stainless Steel Mary at the Holy Spirit Catholic Church in New Castle, Delaware (incidentally visited on the same day as the aforementioned lame Blue Hen). It’s beautiful and a breeze to photograph. 17. Every woman motorcyclist has been asked some cringe-worthy questions while out on their bikes. What is your “favorite”? I was in a parking lot in Cherokee, North Carolina when a guy, seeing my PA license plate, asked me how I got my bike from Pennsylvania to NC all by myself. I told him that my boyfriend started it up for me and I walked beside it the entire way. The look on his face was hilarious. I also once had a pair of elderly ladies ask me if my husband allowed me to ride on the highway. What??? 18. Do you have a holy grail “wonder” that you hope to see one day? Wow. If you asked me that every day I would probably give you a new answer each time. Tintagel Castle is my thing today. It might be somewhere in Bali tomorrow. 19. Do you have a dream motorcycle? That answer changes a lot too. I would actually like to have the wherewithal to have a few styles of bike in my corral simultaneously. A vintage Indian, a touring bike that is small enough for me, a Ural with a sidehack …. etc, etc. 20. Close your eyes and think about riding your motorcycle… Where do you see yourself? The Hai Van Pass in Vietnam. I’ve seen video footage of riders taking the pass and it was just extraordinary. Many thanks to Wendy for sharing her story with us. Roadside Wonders is one of my favorite sites on the net so I hope you enjoy it, too! Awesome! How can anyone not enjoy all the roadside attractions? Thanks so much for turning me on to this great website Fuzzy. Hope to see some of your roadside finds on there soon. I know you must have a few worthy examples tucked away already in your pictures. If you ever get up this way we have some really cool “Large” things to visit too! Who ARE These Wives That “Let” Their Husbands Ride Motorcycles? !